Condensate within a compressor can cause corrosion which results in leaks and/or damage pneumatically powered devices attachments and any processes within the entire air distribution system. What’s more, water or lubricant carryover within the system can contaminate products, processes and result in poor air quality being delivered to critical applications. As such, every air compressor requires a dryer to keep the air supply free of moisture and, to ensure you get the longest operational life out of your equipment with minimal unplanned maintenance throughout the entire air system. When it comes to choosing a dryer, air compressor operators are often left scratching their heads over what kind of device to choose — an adsorption or a refrigerated dryer. Read on to learn the key differences between adsorption and refrigerated dryers so that you can make the most informed decision for your air compressor needs. In an adsorption dryer, also referred to as a desiccant dryer, most air flows over a bed of hygroscopic material—such as silica gel, molecular sieves, or activated alumina—which absorbs the water vapor from the air. As this process continues, the hygroscopic, or desiccant, material becomes increasingly saturated with the extracted moisture. Some desiccant dryers are of a single vessel, non-regenerative design where you must replace the desiccant on a frequent basis. For purpose of this article, will address industrial type regenerative adsorption drying systems. As such, adsorption dryers typically incorporate two drying vessels, one of which dries the incoming compressed air while the other is undergoing regeneration in order to regain its ability to dry the air after it has reached maximum saturation capacity. The dryer may facilitate desiccant regeneration with the help of timers or dew point monitoring devices. Using an adsorption dryer requires that appropriate water separation and drainage protocols are in place prior to the compressed air entering the dryer. If using a traditional oil-lubricated compressor, it is critical to ensure a clean, functional high-efficiency oil separating filter (0.01 micron) with a reliable automatic drainage device is installed upstream of the dryer. In addition, a particle filter (1.0 micron) is recommended for use after the air dryer to prevent the fine abrasive particulate dust from migrating downstream of the dryer. Purge regenerated adsorption dryers, also known as heatless-type dryers use expanded (“purge”) compressed air and require between 15 and 20% of the dryer’s nominal capacity at 100 PSI working pressure for regenerating the off-line desiccant tower. This kind of adsorption dryer is the most mechanically simple and applies to a broad range of air flow rates and, can achieve pressure dew points as low as -100°F. Heated purge regenerated dryers are close to 25% more energy efficient than heatless adsorption dryers, and use an electric air heater to warm the purge air, limiting the required purge flow to approximately 8% while achieving pressure dew points as low as -40°F. Blower purge regenerated dryers regenerate the desiccant by blowing ambient air over an electric heater and onto the saturated desiccant by means of an externally powered blower. Since these dryers do not require compressed air in the regeneration process, their energy consumption is up to 40% lower than that of heatless regenerated adsorption dryers though, they do use about 2% purge air to cool the towers down to prevent dew point spikes at tower switchover. Achieves pressure dew points as low as -40°F. Heat of compression (HOC) dryers harness heat available from the air compressor itself for desiccant regeneration rather than pushing compressed air into an aftercooler. HOC dryers are the most energy efficient type of adsorption dryer since they can reach a pressure dew point (PDP) of around -4°F without requiring additional energy production assuming the compressor operates at full capacity. Additional heaters may be installed to offset a partially loaded compressor or achieve lower PDPs. Due to their high operating temperatures, HOC dryers can only be installed in oil-free air compressors. Refrigerated dryers remove moisture from the compressed air in an energy efficient process with fairly low pressure differentials. The refrigerated air dryer is comprised of an air drying circuit and a refrigeration circuit. Air drying circuit. In an air-to-air heat exchanger, incoming hot compressed air is cooled by exiting cold dry compressed air where water vapor begins to condense. Then, the pre-cooled incoming air enters an air-to-refrigerant heat exchanger in which the air is cooled to around 38°F with cold liquid refrigerant. During this step, remaining moisture condenses into liquid and is drained from the circuit. Finally, this process has gone full circle as the cold dry compressed air enters the air-to-air heat exchanger where it is warmed by the incoming hot air to around room temperature to mitigate condensate on the downstream air piping network. Refrigeration circuit. A refrigeration compressor pumps highly pressurized, hot gas refrigerant into a condenser (radiator) that transfers heat from the refrigerant to the ambient air which condenses the high pressure gas into a high pressure liquid. Then, the high pressure liquid refrigerant flows through an air-to-refrigerant heat exchanger where the refrigerant-side, absorbs the heat from the air-side and, converts into a low pressure refrigerant then into a low pressure gas as the air-side is chilled. Finally, the now low-pressure, warm refrigerant gas is drawn back into the refrigeration compressor so that the cycle can begin again. Non-cycling refrigerated dryers keep the refrigerant compressor running continuously regardless of air flow rate or moisture content and control the PDP through a hot-gas or expansion valve that recirculates the refrigerant to prevent internal freezing. They are generally less expensive to purchase and as such are more common than their cycling counterparts and, come with a promise of high reliability and generally low maintenance costs compared to the adsorption type drying systems. Cycling refrigerated dryers act like your refrigerator at home and thus, are unique in their ability to either increase or decrease cooling capacity — and thus, energy consumption — in accordance with your actual air usage. Most cycling dryers are able to do so thanks to two features: a modulating valve on the side of the refrigerant compressor that can restrict refrigerant flow and a high thermal mass, enabling the storage of refrigeration capacity during low air loads. Due to their ability to modify energy consumption, they are more energy efficient than non-cycling models. 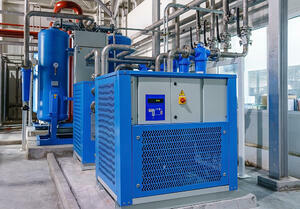 What are my compressed air applications? What are the specific temperature and moisture level demands of these applications? How might these parameters change in accordance with environmental conditions or applications? What are the federal, state or industry regulations by which I must adhere? What kind of accessories or pneumatic tools must I use in tandem with my compressed air system? With a variety of adsorption and refrigerated models to choose from, Mattei air dryers are compatible many air compressor models and are ideal for applications any industry — from manufacturing and agriculture to food and beverage or pharmaceutical. Regardless of the specifications of your applications, a Mattei air dryer can provide unmatched reliability, efficiency, durability, and cost-effectiveness.